The Bintelli Sprint features modern styling and a very attractive price. While being our most affordable model, it still has room for two passengers and is fully loaded! Only a drivers license is required! With an aggressive look, the Bintelli Bolt comes with upgraded 12" wheels and oversized disk brake. Still extremely affordable, the bolt is loaded with features and has room for two passengers. The finest scooter we sell, this two stroke scooter will out-run the 49cc 4-strokes EVERY TIME. Comes with all the modern luxuries, Adly proudly backs their scooters with a 2 year warranty and roadside assistance. If your looking for a no hassle, top of the line machine, this is it! With HUGE 26"x4" wheels, the M1 can roll over anything. 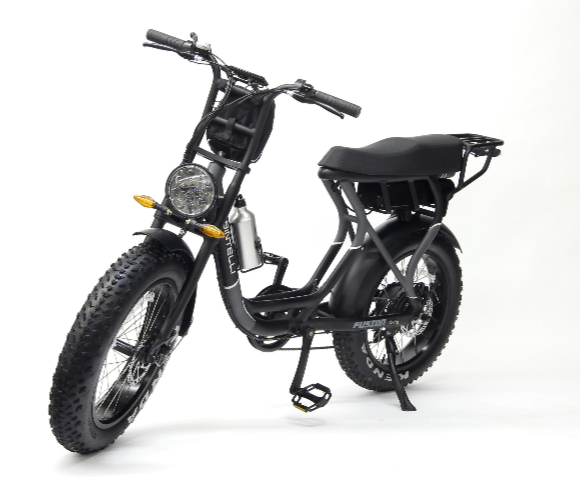 The 48v 500watt motor keeps up with the top notch in the E-bike world. The Fusion combines everything into one. Part moped, part scooter, part E-bike… the Fusion has the best parts of it all.